Hugo is a very friendly and affectionate dog, he adores people and wants lots of love and cuddles though he does need someone to help him build his confidence around dogs as he was bitten in his past and is a bit afraid. Hugo doesn’t realise his size and thinks he’s a lap dog and loves to relax on a nice big bed, after his long walks with you of course. Hugo could live with a family with school age children and dogs, but no cats or smallies please. Hugo featured in Pete’s column last November. Hugo has been a part of our household since December 2017. It is fair to say he came like a whirlwind but we have all settled into life together, and we can both honestly say that adopting Hugo has been a great decision. Obviously adopting a rescue dog means there are things you will never know about them, especially when they were a stray like Hugo. 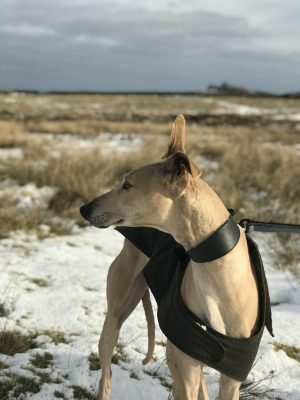 We found out a little more about our lovely boy by purchasing an online DNA test which has given us more information about his heritage, Hugo is part Greyhound part Sloughi, more commonly known as the Arabian Greyhound. This certainly explains his darker underside and legs, and some of his cheeky characteristics! Hugo loves his walkies especially in Haldon forest just outside Exeter and on Dartmoor, but the best walk of all is by the beach as they sometimes end with us all sat in the back of the car with fish and chips! After a long walk there is nothing Hugo loves more than a rest on his bed, most usually with a chew toy. Being a dog however, means that he doesn’t quite understand the difference between his toys and our coffee table, his leads and two car seat belts which have also been treated as chew toys! We have started to share a few of Hugo’s adventures (and his funny poses) on Instagram where he appears as @hound_hugo.